A strop is a leather strip used to polish the edge of a chisel, a plane iron or a knife. Stropping is the final part of the process in achieving a truly sharp edge. Stropping has always been the accepted way to finishing a cutthroat razor guaranteeing the closet of shaves. Unlike sharpening or honing, which removes metal from the bevel, stropping burnishes away any microscopic metal strands clinging to the edge and polishes the bevel and back of the blade. Once the point where these two meet is as smooth as possible, the edge will be at its sharpest. The abrasive used to aid the polishing process needs to be finer than the final sharpening stone otherwise stropping becomes a backward step. Most abrasives for this purpose are a mix of the powder and a waxy substance. Formed into a solid block, simply apply to the strop just like using a crayon. Only ever apply compound to one side of the strop, the other side should remain abrasive free (although it will pick up a little over time this will not affect the result). The strop only requires a minimal amount of compound, rub a little compound along its length in a simple wavy line. Begin with the side charged with compound uppermost. Hold the blade at the end of the strop furthest away from you with its bevel flat against the strop. Apply gentle but firm pressure and pull the blade towards yourself. Dragging the edge in this way avoids digging into the strop. (Roll gouges or curved tools at the same time as pulling in order to polish the entire edge). Try to maintain a constant angle; any slight inaccuracy does not affect the outcome. After 10 or 12 strokes on the bevel, turn the blade over. Place the back of the blade flat on the strop and then draw it the length of the strop. Again, repeat 10 or 12 times. Repeat stropping the bevel followed by the back a few more times. 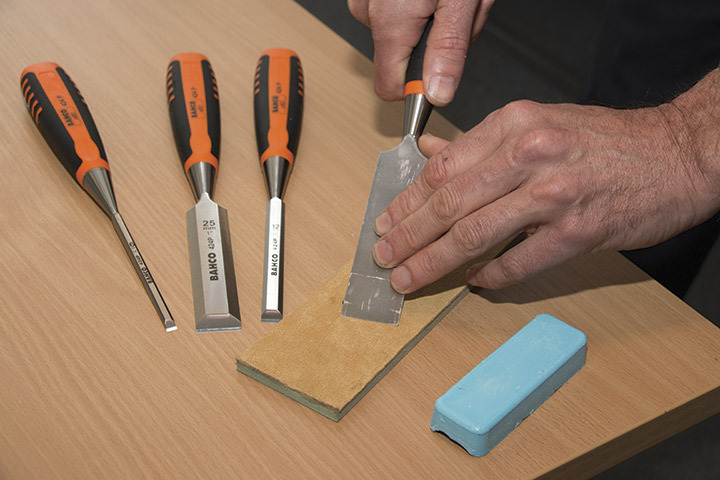 Turn the strop over and go through the same process using the ‘non-abrasive’ side. After this step, the blade will be at its sharpest and the result noticeable in the way the blade cuts and the quality of the timber surface it leaves behind.